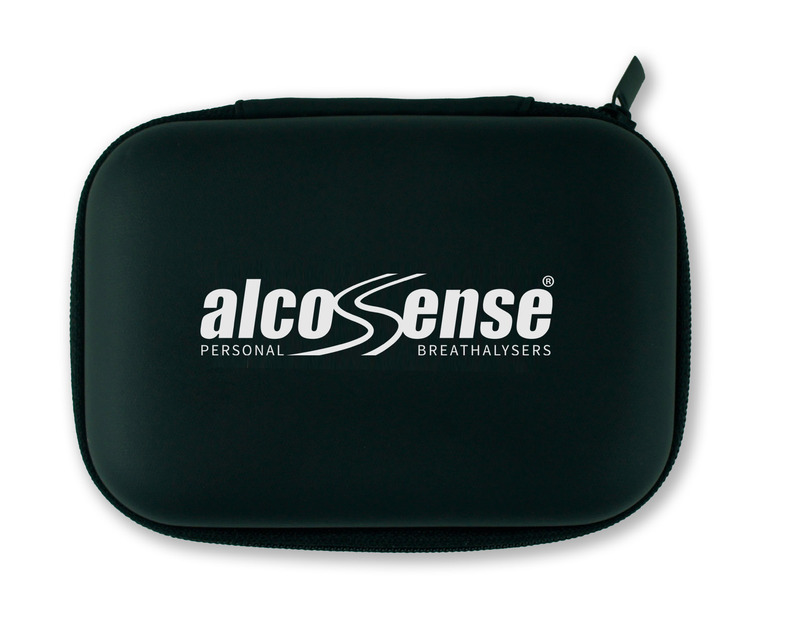 The AlcoSense Universal Carry Case has been designed to work with all AlcoSense electronic breathalyzers, storing both the breathalyser itself and a couple of blow tubes or one-way mouthpieces. The pocket sized case is made from rugged hard formed material with a rubberised soft touch finish. It features a netted pouch inside the case and zip to keep the case closed and secure. The AlcoSense Lite and Elite secure into the left side of the pouch behind the netting, and blow tubes can be stored in the right hand side of the case. 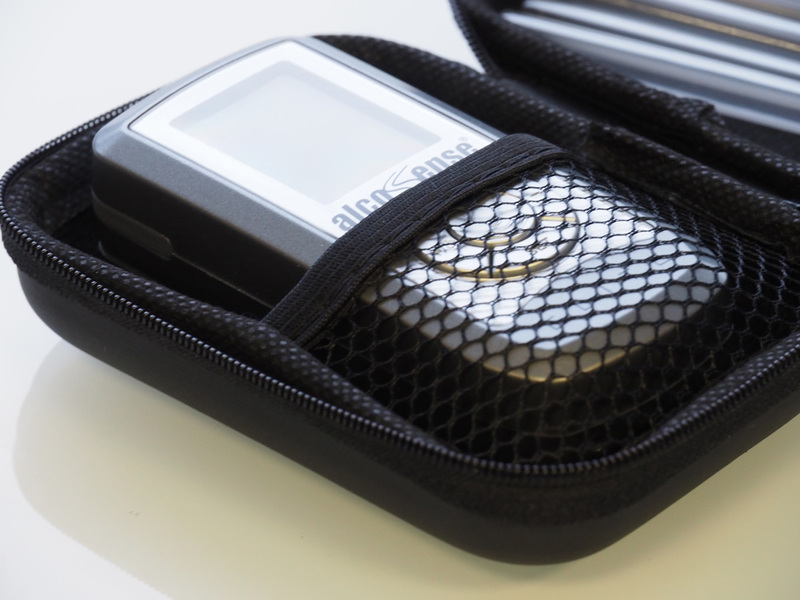 The AlcoSense Excel, Pro and Ultra sit in the right hand side of the case, and either blow tubes can be stored on the left hand side behind the netting, or the Professional one-way mouthpieces can be stored next to the breathalyzer. Fast delivery & product even better quality than expected. Well worth the price. This item is for an alcosense Excel breathalyser machine. It is well made and quite sturdy and has a pocket inside so you can carry spare breath tubes. Not completely sure on the accuracy but if it says don’t drive I don’t. Good strong case. Well made. Stylish and add degree of protection when in a bag. Useful if you are regularly on the the road. Takes a couple of mouthpieces plus the unit. Great little product fits perfectly. Handy case to keep your breathalyser in. Great carry case for this product. Great case for an excellent product. If you are planning to keep the sensor in the car or somewhere where it is going to get knocked around a bit this little case is a good idea to protect it. Nicely made and compact. handy case to carry and protect unit.only downside is alcosense in large white letters on case lets everyone know what it is. An excellent product to give you peace of mind the night after. Alcosense pro I bought is a delicate machine in the hand so definitely needs this case which I only ordered afterwards. Its a strong case and it holds extra batteries and straws cos the alcosense eats the batteries. 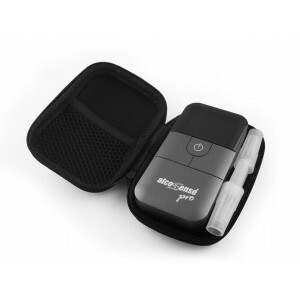 Great product for protecting your delicate breathalyser. Bought this to protect my Alcosense Elite and hold the extra blow straws during storage. Does this perfectly and is necessary to protect your delicate breathalyser. Great product. Bought the AlsoSense and pipes for my son's birthday and this looks a good addition. Fits the Alcosense pro perfectly for added protection. Just enough room for a couple of mouth pieces as well. Well made case good quality. Provides good protection for the AlcoSense unit plus enough space for spare tubes. Great quality & simple to use! Great product and simple to use. I wanted this as I attend many business events where drinks are always flowing and wanted to be sure that I was legal to drive the morning after.I've recommended it to my clients too, for their employees who attend lots of events.I bought the carry case too with extra tubes so I could bring it with me when travelling. Better safe than guessing! Perfect case for the Alcosense Pro although I personally don't like having the label printed on the exterior. I think most people would like to carry the breathalyser without broadcasting the fact to all around.Room for the unit and two mouthpieces. Definitely worth buying to protect the unit. Top quality product, used by police in Europe. Reasonable price. A good purchase. The unit comes with the same hardware specs as police units. This unit however can be customised through settings, to mirror alcohol regulations in a myriad of countries. Driving to a party in Paris? Just change the settings to France, and you're ready to rock.Batteries are included. 5 mouth-pieces are included. Full decent instructions are included. A decent purchase. Fit's the device perfectly with enough room for some spare mouthpieces. Seems good quality but only had it a few days. If you spend £40 on a breathalyser, you need to look after it and this case does just that. It also has a section for carrying spare blow pipes and the calibration checking bits that come with the unit. Could have had a little more depth to accommodate the tester and a couple of mouthpieces. I still rate it a 5 star product. Convenient way to keep the kit together and offers protection. Fits the Pro and has a pocket in the inside lid for 5 spare blow tubes. Handy protection if you leave the device in the glovebox for instance. Arrived on time and has extra space for spare straws. Nice case but a little flimsy - I accidentally switched the breathalyser on twice with the case closed. No big deal, but loses a star. 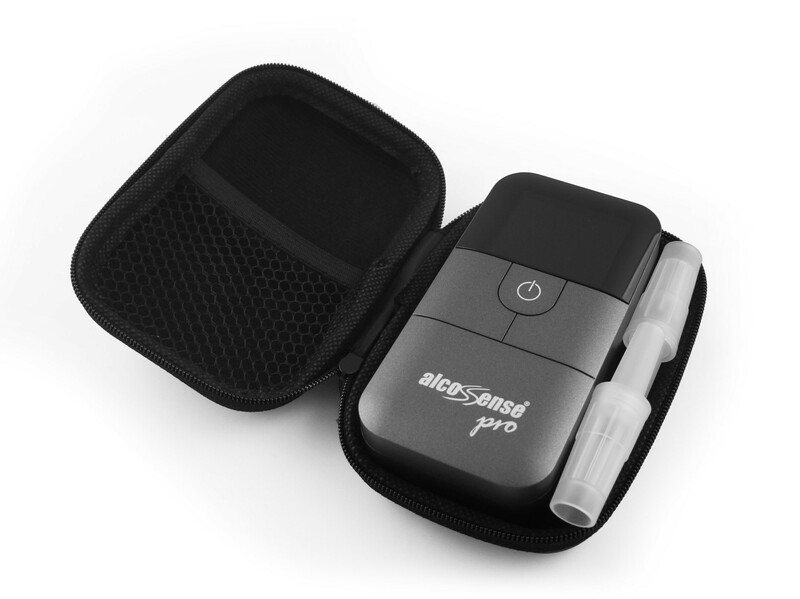 The Alcosense Pro fits securely inside along with two mouth-pieces.This semi-hard case is perfect for purpose. Arrived on time and was as described. This is great to keep the device in. Excellent compact case for keeping the alcosense clean and the blow tubes handy. The elite fits perfectly as described. The case is ideal for the Alcosense Elite and for the mouthpieces. They all fit niceley inside and are protected from dirt, dust and the odd knock. I would definateley recommend buying this to keep your Alcosense breathalyser safe and secure. I believe it is a perfect fit for the Alcosense Lite too. Very well made with good protection to the Ultra. Enough room inside to carry 4 or 5 mouth pieces. Top quality durable case. Good Value. A top quality zip-up semi-hard case, will last a very long time.Protects the AlcoSense breathalyser very nicely.Just enough room to hold my AlcoSense Pro and a couple of mouthpieces.I would have preferred it to be 5mm wider (deeper) to more easily carry the mouthpieces, but I'm not compalining. Thanks for the review, greatly appreciated. When using the Pro in the case the mouthpieces sit next to Pro as opposed to in the netting. The netting is only used when you have either the Lite or Elite in the case. Please see the pics on the product page on the website for more information. Great case, robust and just what I needed when carrying in the car. Prompt service and great communication all through the transaction. Good, but a little tight for the Ultra. This case is great for the Elite, but is a little tight for the Ultra if you want to keep a couple of tubes with it. I use it for the Ultra hence the 4 stars. I also have an Elite which easily fits with 4 or 5 blow tubes. Keeps the unit safe and damage free. Great buy, great price. The perfect protection for my Pro and a mouthpiece. Snug fit so it doesn't rattle around. Sensible pricing and free delivery. The case is very well made and looks good. The meter fits very well and you can carry up to 4 mouthpieces. Perfect - except - the unit does not fit exactly in the case. It moves about and is loose. A minor grizzle I admit but if you're going to design a case - DO IT PROPERLY. However I love it - and the case - and wouldn't be without either. I recommend both regularly and show it to people regularly. Thanks for the review. I'm not sure which model you use it with but each model fits in a different way to make sure they're snug. If you check the images on the item you can see which product fits in how so they aren't loose. Any questions please give us a call on 0800 1950088. A little tight packing blow tubes and the AlcoSencePro; quality is ok overall good value for money for only £9.99! Quality product and a must to protect your machine. Great that it`s a hard carry case and not cloth and also has room for several blow tubes. Highly recommended and very reasonable price. Overpriced for what it is - took so long to arrive. I have 2 of the devices and decided to purchase a hard shell camera case of eBay for the second one for £1.99, after I saw the quality of the first one. It works perfectly well. Took an age to arrive - I get heavy engine parts from the USA in 2 days but a carry case from the UK takes over 2 weeks - poor show. We're sorry to hear you're disappointed in the case. Quality has never been a complaint from any customers so I'm not sure if maybe you have a faulty case? If so please contact us and we will happily repair or replace as necessary. I have looked into your order and see that when you placed your order the case was advertised as a pre-order item on the site with an estimated time of arrival. The case was dispatched within the time frame indicated on the site. They're now in stock and available for same day despatch. In terms of value, the case is custom made in small numbers which means it will cost more than a generic eBay case which may not fit the items properly. The AlcoSense case fits all AlcoSense products and blow tubes or mouthpieces, as a result we do feel that it offers good value for money. Good quality product. Hard shell case will protect your machine from dirt and damage. Compartment for straws is also handy to keep everything together. Very useful protection at a reasonable cost. In my view an essential item to protect the breathalyser and keep it clean when it is being carried. It is well made and ideally suited to perform its intended use. If there was any small niggle it would be that a simple hanging loop would aid with storage indoors. The case fully protects the model of alcosense machine I have and does the job it says it does. 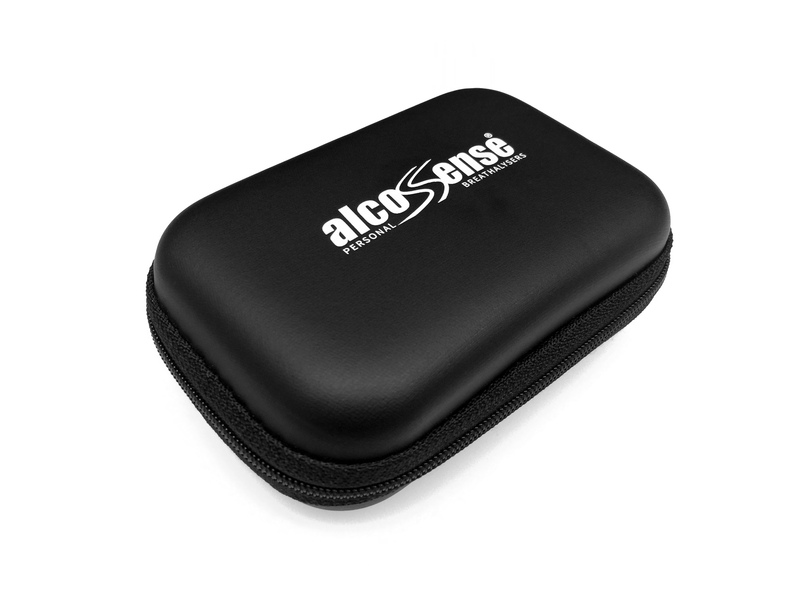 A great carry case to go with your Alcosense Pro. Beings so great looking you'll almost certainly want to look after your Pro, and this is just the thing to do that, it's smart, small, and looks fantastic. As you can see it'll hold a couple of the blow tubes supplied with the Pro, as well as an area for the other slimmer tubes supplied with the older models. 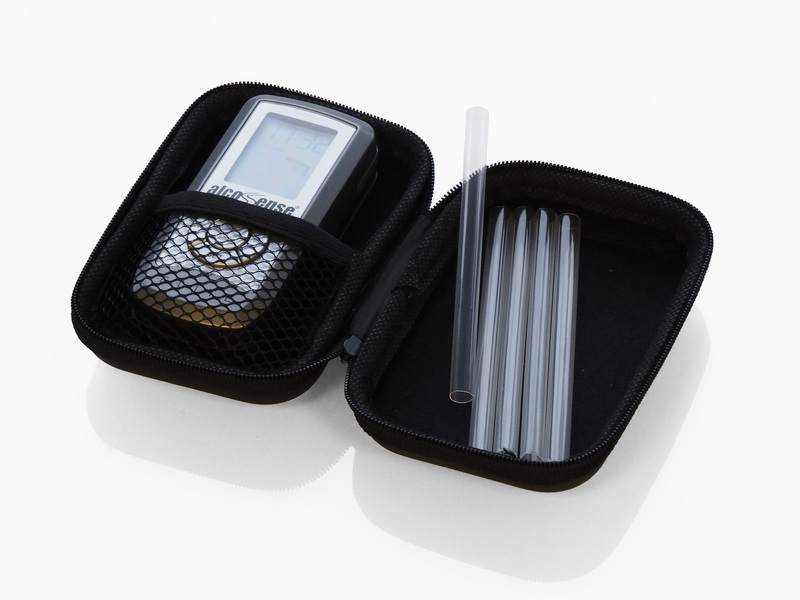 Case does an excellent job in protecting my breathalyser and has a handy pocket for storing straws and cleaning items. would recommend to all users of Alcosense Pro. Really good price compared to other similar case's. The hard case gives solid protection which is well worth while considering the price of the unit it is protecting. Just the right space for all the blow tubes you need. It's solid and well made, and would doubtless do the job as intended. Personally, it would be used seldom, as nowadays I tend not to go away often enough to need to offer the unit protection. But I did try it, and though a simple container is hardly rocket science, I think it would have been helpful to show a unit packed in to it. It's not immediately clear what the mesh pocket is for, and though I eventually managed to squeeze in both the unit and a mouthpiece, a picture of how it should have looked would have shown me whether I'd got it right or not. The case is robust and well made. The size is right for the device and easily packed on a trip. It fits my AlcoSense Elite in nice and snug and there's even room for 5 blow tubes in there. I put the breathalyser in the netted side of the case to stop it from moving round and the tubes on the other side. It keeps it nice safe and stops it from getting scratched or knocked. It's quite goof value as most carry cases for cameras etc of a similar design would be £15-20. I would recommend.